Baptism is the first Sacrament that we receive as Catholics to mark the beginning of our faith journey. The Catechism of the Catholic Church teaches us that baptism is “the basis of the whole Christian life, the gateway to life in the Spirit…and the door which gives access to the other sacraments.” Baptism allows one to “put on Christ,” makes us the sons and daughters of God, and members of the Church community. 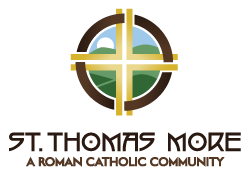 Baptisms at St. Thomas More Catholic Church are scheduled on a regular basis throughout the Liturgical year. ​ There is a preparation period prior to parents having their children baptized. It is required that parents attend the Baptismal Preparation Course which consists of 2 sessions. These sessions discuss our Catholic Faith, our Call to have our Children Baptized, the importance of naming, the role of the Godparents, the symbols at baptism, and the logistics of the baptism ceremony. First Eucharist Weekend will be held the weekend of May 4/5, 2019 at the 5:00 pm Mass, 8:15 am Mass and the 11 am Mass. The Sacrament of Reconciliation is celebrated Saturday evenings from 3:30 pm until 4:45 pm, or by appointment with the Parish Priest.